Christopher Hives is the University Archivist. Originally published in The UBC Alumni Chronicle , Volume 44, No.3, 1990. The idea of establishing a provincial university in B.C. first came in 1877 from John Jessop, superintendent of education. He was concerned that local students would be forced to travel to other provinces and countries to get a university education. But other considerations occupied the attention of those responsible for building a new province and the matter of a provincial university lay dormant until the 1890s. In 1890, the Provincial Legislature passed “An Act Respecting the University of British Columbia”. Under terms of the Act, all graduates of any university in the Dominion resident in British Columbia became members of the University and constituted the first convocation. A committee struck at the first meeting of convocation drafted a series of amendments to the 1890 Act which were adopted and passed in 1891. Unfortunately, the “British Columbia Amendment Act” carried the seeds of its own destruction. One of its provisions required that a meeting of Senate be held within one month of the election of senate by convocation. After the June 1891 election of Senators the July meeting failed to produce a quorum. Consequently, no further action was possible under the 1891 Act and the first attempt to establish the University of British Columbia failed. With virtually no prospect of establishing a provincial university immediately, those interested in the matter of higher education in B.C. explored the idea of setting up a working relationship with existing Canadian universities. Acts passed in 1894 and 1896 allowed B.C. high schools to affiliate with Canadian universities. The high schools could then be incorporated as colleges of these institutions. Under these enactments Vancouver High School affiliated with McGill University in 1899 and offered first year Arts courses under the name Vancouver College. Although the success of the program prompted an expansion in course offerings to include second year Arts courses in 1902, students were still required to travel to McGill University to complete their degrees. The effort to establish closer connections with McGill, and to provide a wider selection of offerings resulted in two 1906 Acts which provided for the establishment of McGill University College of British Columbia. All connections with Vancouver College were severed and the new institution operated as an independent college of McGill. McGill University College operated between 1906 and 1915 and allowed several hundred B.C. students the luxury of home-based higher education. Although it experienced substantial support, this development did not proceed unopposed. Some people hoped for an affiliation with the University of Toronto while others felt it vital to develop an indigenous institution. The arrangement was attractive to the government as it allowed for the provision of higher education without requiring the province to underwrite the entire cost. The establishment of McGill University College of B.C. did little to discourage the efforts of those wanting to build a Provincial University. In 1908, their efforts resulted in the passage of An Act to Establish and Incorporate a University for the Province of British Columbia. Much of the credit for securing this legislation belongs to the personal efforts of Dr. Henry Esson Young who served as provincial secretary and minister of education. The provincial legislature passed an act in 1910 establishing a Site Commission. After a careful examination of several cities and rural areas, the Commission selected Point Grey as the most suitable location for the university. The government agreed and granted a 175-acre site at Point Grey to the university. In 1912 Young announced a competition for the general design of the university as well as detailed plans of four buildings to be constructed immediately at the Point Grey campus. The plans submitted by the firm of Sharp and Thompson won the competition. The most significant event of 1912 was the first meeting of convocation under the terms of the 1908 Act. The 849 members of convocation elected Francis Carter-Cotton as UBC’s first Chancellor, and a fifteen-member Senate. This meeting laid the foundation for the establishment of the new university. Wesbrook, together with the Board of Governors and the Senate assumed the task of organizing the new university and ensuring that it opened as originally scheduled, Fall of 1913. The enormity of the task, however, prompted Wesbrook to request that McGill University College continue to provide higher education in B.C. for two more years. In 1913 the Legislature voted $500,000 with a promise of $1,000,000 for the following year. This enabled the University to proceed with the task of clearing the Point Grey campus. Work began on the Science Building the following summer and soon the concrete and steel framework began to take shape. The outbreak of World War I halted the ambitious plans for the Point Grey campus. 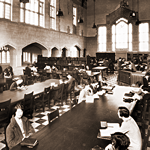 With the diversion of resources for the war effort it was decided to withhold the contract for the completion of the Science Building and to postpone expenditures for the library and grounds. For almost a decade the bare girders of the Science Building came to symbolize the unrealized vision of the Point Grey campus. In spite of suspending work on the campus, the provincial government did provide sufficient funds to open the University of British Columbia on 30 September 1915. At this time, many of the faculty, staff and students, as well as the assets of McGill University College were transferred to the new provincial university. The opening of UBC on the Fairview property of Vancouver General Hospital passed without ostentatious ceremony in deference to the demands of the war and because the facility lacked any building large enough to accommodate the entire student body of 379. The use of the shacks at Fairview was viewed as an exigency measure and those connected with the new university hoped that work would soon resume on the Point Grey campus. With a depleted treasury, however, the provincial government did not consider the expenditure of funds on the university as a high priority. UBC would spend its first decade at Fairview. Unfortunately, President Wesbrook died shortly before the armistice in 1918 — his dreams for a new campus for the university still unrealized. He was replaced by Leonard S. Klinck who had been the university’s first appointment as Dean of Agriculture in 1914. With every passing year at Fairview, the inadequacy of the facilities became increasingly obvious. Between 1916 and 1922 enrollment at UBC expanded by 211% while the capacity of the buildings had only grown by 25%. The public and private wards of a small three-floor former hospital building made reasonably good classrooms while the rest of the facilities including the auditorium, offices and lecture rooms were housed in old army shacks. As the number of students grew, additional space had to be found. Agricultural classes were conducted in a private residence, French was taught in the basement of a Baptist Church unused by its congregation during the week, and chemistry classes were conducted in the famous “chemistry tent” erected on the Fairview site. Despite these positive aspects, however, the truth remained that UBC desperately needed new facilities. The increasing hardships in conducting classes at Fairview prompted UBC students to solicit public support through a petition to encourage the provincial government to resume work at Point Grey. A.M.S. president Ab Richards headed a “Build the University” campaign beginning in the Spring of 1922. An Executive Committee consisting of Richards, R.L. McLeod, J.V. Clyne, Betty Somerset, Marjorie Agnew, Jack Grant, Aubrey Roberts, Al Buchanan, Percy Barr and Alumni Association president John Allardyce coordinated the student activities. The campaign began with the collection of signatures when students went back to their home towns for the summer. After returning to Vancouver in the Fall, the students took their petition door-to-door and also spoke to various organizations. The publicity campaign also received good support from the press. The week of October 22nd to 29th was declared Varsity Week. By this time the signatures on the petition numbered 56,000. The activities of the week culminated in a pilgrimage to Point Grey now known as the Great Trek. On October 28th almost 1,200 students with floats, bands and banners marched through downtown Vancouver and on to the Point Grey campus. Following the pilgrimage, Ab Richards, Jack Grant, and J.V. Clyne travelled to Victoria where they presented the 56,000-name petition to Cabinet. Six page boys hauled the petition rolls into the House. Premier John Oliver adjourned the Legislature to listen to the student representatives. Their presentation and the solid public support evidenced by the petition convinced the Government to resume work on the Point Grey site. The successful campaign to “Build the University” was noteworthy in that it was entirely conceived and conducted by the students of UBC. In addition, the activities of the students in undertaking an intensive public-awareness campaign helped to promote a better understanding of the goals and functions of the University amongst British Columbians. The government provided funds to complete the Science Building and erect the Library and Powerhouse according to the original plans. The remaining requirements would be met by some “semi-permanent” buildings. Completed in 1923 and 1925 respectively, the Science Building and Library stood as impressive but isolated structures on the stark campus. The granite facing stone used in their construction was quarried on Nelson Island in Pender Harbour and carried by barge to the foot of the Point Grey cliffs. From there workmen hauled the stone to the building site using an aerial tramway and light railway system. In the Spring of 1924, work began on six new frame and stucco buildings on the campus. Constructed at an approximate cost of $500,000, the buildings were originally intended to last for twenty or twenty-five years “if required”. They included agriculture, applied science, arts, auditorium, and administration. Despite their impermanence, the original buildings are still in use some sixty-five years later. The 1925 campus was significantly less grandiose than that envisaged in the original 1914 plan. Although freed from the inadequate and overcrowded facilities at Fairview, certain aspects of the partially-unfinished campus left something to be desired. Only a modest few buildings dotted the spacious campus. There were no trees or grass and roads and sidewalks were only just under construction. The students had no playing fields or gymnasium. Piles of building debris littered the campus with dust and mud everywhere. Initial conditions were such that some students light-heartedly considered a return trek to Fairview. From these humble beginnings the University of British Columbia has developed into an outstanding institution of higher education during its seventy-five year history. The true test will come twenty-five years from now during the university’s centenary. Its success may then be measured by the degree to which the institution continues to be driven by the original spirit instilled and inspired by Wesbrook and the other pioneers who shaped the university during its formative period.